3ft Latex Balloon Printing. We also print onto Qualatex 30″ & 36″ latex balloons offering a single colour print onto one or two sides but giving you the option to have a different design on each side and even a different ink colour. These balloons are silk screen printed for hi-definition results giving a clean crisp print. The minimum order for these balloons is 10 and we offer a quick turn-a-round. Choose from over 31 vibrant colours in the 3 foot standard, fashion & jewel tone range and 14 colours in the 30″ pearl tone range. Chloroprene Balloon Printing. Need something a little BIGGER, then look no further. We are the only company in the UK that can offer you silk screen printing onto these giant balloons. These balloons come in 2 sizes, 4 foot and 5.5 foot and are available in 7 vibrant colours. These balloons are silk screen printed and again give you the option for a single or double side print but with the option for a different logo or message on each side. These balloon when filled with helium to the desired size will float for up to 8 days and can be used indoor or outside (Weather permitting). 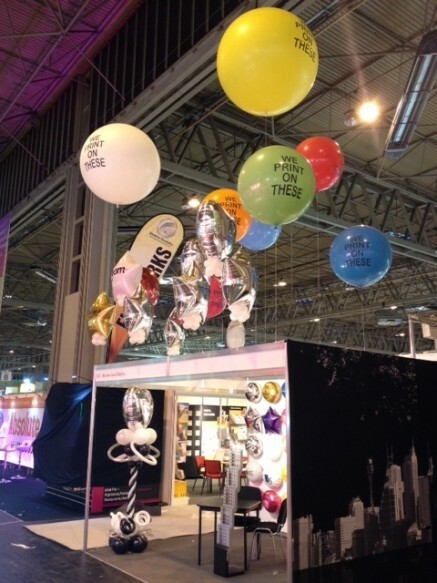 For exhibition stands these balloons are a must and are certain the lift you above the competition.